Purpose: To orthopedically realign the mandible to the cranium back to a position that provides relief from pain and dysfunction after a significant physical trauma. It stabilizes the temporomandibular joints and restores them back to normal physiological function while at the same time reduces contracted (spastic) craniofacial and cervical muscle activity, normalizing function and resting modes to pre trauma conditions. 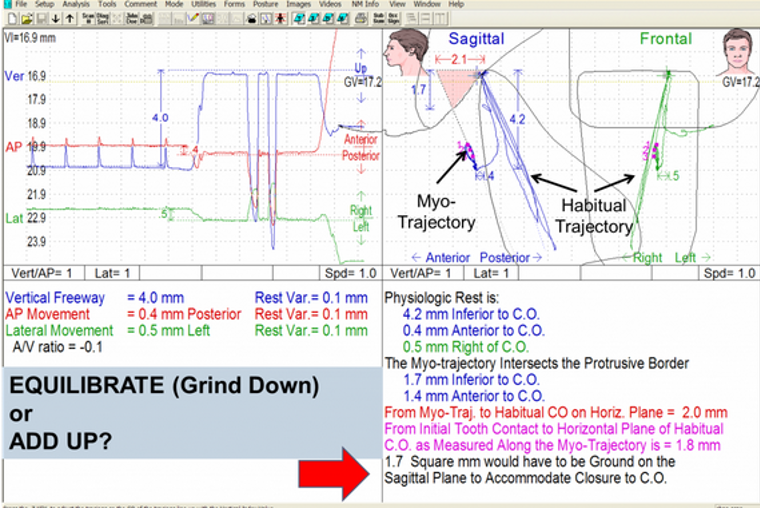 Anatomical, functional, comfortable – Effective resolution (requires trained dentist to adjust the occlusion/bite accurately, detail, using GNM micro occlusal protocols along an optimized myo-trajectory. No guessing). “Several studies have concluded that TMD patients experience the greatest clinical success after receiving treatments that involve restoration of optimum function of the mandible, muscles and TM joints, through use of intraoral orthotic appliances of various designs”. (Cooper B: Temporomandibular Disorders: A Position Paper of the International College of Cranio-Mandibular Orthopedics (ICCMO)., Journal of Cranio Practice, July 2011, Vol. 29, No. 3., pp. 237-244). The GNM orthotic is a specifically designed and custom fabricated “orthopedic” appliance where the treating clinician used strict bite (Optimization) recording protocols using both the J5 Myomonitor TENS to establish the occlusal position and K7 kineseograph. This appliance is unlike other classical appliances in that it implements both gnathologic and neuromuscular principles. The reader must not confuse this with other neuromuscular (NM) orthotics. The GNM approach and orthotic design is one that can’t been compared by meerly looking at the external (visual) features as much as to its true physiologic inherent components that support optimal muscles balance, TM joint harmony, occlusal harmony and many other functional features that move physical dysfunctions to physiologic quality health and shifts functional impairments to an improved quality of life. These are some of the attributes that patients have reported that makes a difference. Orthopedically realigns the mandible to the cranium. Fulfills the TEN Foundational KEYS of MICRO OCCLUSION for Maximum Dental Improvement and Stability. Fulfills the clinical requirements of Gnathologic Occlusion at an “Optimized” neuromuscular position. Phase I – Diagnostic TMJ Pain Therapy, Masticatory Dysfunction, Joint Derangement. Phase II – Orthodontic/Orthopedic Restorative Foundation, Facial/Esthetic Development. Cervical dysfunction problems – unresolved pain around the facial, temporal, occipital, SCM, shoulder and posterior corner of the mandible. TMJ primary problems – unresolved click, popping, grating sounds, restricted opening and closing. Retrognathic Class II division 2 (maxillary incisors tipped back) problems – difficulty for most dentist to find a “physiologic jaw position. Anterior open bite problems – unresolved TMD pain cases that have minimal to no over jet and over lap of the front teeth. These are the type of problems most occlusal, TMD and often classical neuromuscular philosophies struggle with establishing and effective resolution. The following is a jaw tracking recording using the K7 kineseograph and Myomonitor TENS. This is the kind of objective data the GNM dentists uses in addition to many other forms of physiologic recordings to determine a physiologic jaw relationship in establishing a proper mandibular to maxillary relationship for the orthotic to fit the mouth in a stable position. Too many professionals do not consider the importance of the patient’s occlusion (how teeth related to one another). Neither do they understand how the bite is suppose physiologically come together. To other dentists it really does matter. At OC we believe location location location is paramount for any occlusal treatment. Where do you want your occlusal gears to land? On the runway or off. The plane will land some where. Trajectory leads to a terminal contact, but where? Cooper B, Kleinberg I:. Establishment of a temporomandibular physiological state with neuromuscular orthosis treatment affects reduction of TMD symptoms in 313 patients. J Craniomandib Pract 2008; 26(2):104-117. (Read complete article). Coy RE, Flocken JE, Adib F: Musculoskeletal Etiology and Therapy of Craniomandibular Pain and Dysfunction. Intraoral Orthotics, page 163-173. Chan, CA: Treating Craniomandibular Dysfunctional Patients Implementing Gnathological or Neuromuscular Concepts. International College of Craniomandibular Orthopedics (ICCMO) Anthology VI, 2003. The glossary of prosthodontic terms. J Prosthet Dent 2005; 94(1):10–92. Clark GT. A critical evaluation of orthopedic interocclusal appliance therapy:design, theory, and overall effectiveness. J Am Dent Assoc 1984; 108(3):359–64. Ekberg E, Vallon D, Nilner M. The efficacy of appliance therapy in patients with temporomandibular disorders of mainly myogenous origin. A randomized, controlled short-term trial. J Orofac Pain 2003; 17(2):133–9. Raphael K, Marbach JJ. Evidence-based care of musculoskeletal facial pain. Implications for the clinical science of dentistry. J Am Dent Assoc 1997; 128(1):73–9. Al-Ani MZ, Davies SJ, Gray RJ, Sloan P, Glenny AM. Stabilization splint therapy for temporomandibular pain dysfunction syndrome. Cochrane Database SystRev; 2004:4. Forssell H, Kalso E. Application of principles of evidence-based medicine to occlusal treatment for temporomandibular disorders: are there lessons to be learned? J Orofac Pain 2004; 18(1):9–22. Dao TT, Lavigne GJ. Oral splints: the crutches for temporomandibular disorders and bruxism? Crit Rev Oral Biol Med 1998; 9(3):345–61. Kreiner M, Betancor E, Clark GT. Occlusal stabilization appliances. Evidence of their efficacy. J Am Dent Assoc 2001; 132(6):770–7. Klineberg I. Occlusal splints: a critical assessment of their use in prosthodontics. Aust Dent J 1983; 28(1):1–8. Capp NJ. Occlusion and splint therapy. Br Dent J 1999; 186(5):217–22. Messing SG. Splint therapy. In: Kaplan AS, Assael LA, editors. Temporomandibular disorders: diagnosis and treatment. Philadelphia: Saunders; p. 395–454. 1991. Widmalm SE. Use and abuse of bite splints. Compend Contin Edu Dent 1999; 20(3):249–54, 256, 258–9. Bernhardt O, Gesch D, Splieth C, Schwahn C, Mack F, Kocher T, and others. Risk factors for high occlusal wear scores in a population-based sample: results of the Study of Health in Pomerania (SHIP). Int J Prosthodont 2004; 17(3):333–9. Blanchet PJ, Rompre PH, Lavigne GJ, Lamarche C. Oral dyskinesia: a clinical overview. Int J Prosthodont 2005; 18(1):10–9. 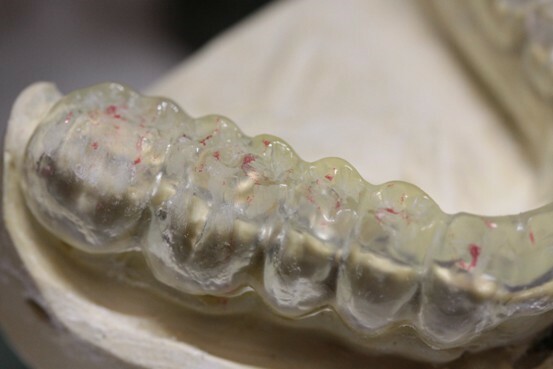 van der Zaag J, Lobbezoo F, Wicks DJ, Visscher CM, Hamburger HL, Naeije Controlled assessment of the efficacy of occlusal stabilization splints on sleep bruxism. J Orofac Pain 2005; 19(2):151–8. Shankland WE. Migraine and tension-type headache reduction through pericranial muscular suppression: a preliminary report. Cranio 2001; 19(4):269–78. Shankland WE. Nociceptive trigeminal inhibition-tension suppression system: a method of preventing migraine and tension headaches. Compend Contin Educ Dent 2002; 23(2):105–8, 110, 112–3. Dylina TJ. A common-sense approach to splint therapy. J Prosthet Dent 2001; 86(5):539–45. Kurita H, Kurashina K, Kotani A. Clinical effect of full coverage occlusal splint therapy for specific temporomandibular disorder conditions and symptoms. J Prosthet Dent 1997; 78(5):506–10. Lucia VO. Modern gnathological concepts: updated. Chicago: Quintessence; p. 99–104. Bruno SA. Neuromuscular disturbances causing temporomandibular dysfunction and pain. J Prosthet Dent 1971; 26(4):387–95. Jokstad A, Mo A, Krogstad BS. Clinical comparison between two different splint designs for temporomandibular disorder therapy. Acta Odontol Scand 2005; 63(4):218–6. Okeson JP. Management of temporomandibular disorders and occlusion. 5th ed. St. Louis: Mosby; 2003. p. 527. Nitzan DW. Intraarticular pressure in the functioning human temporomandibular joint and its alteration by uniform elevation of the occlusal plane. J Oral Maxillofac Surg 1994; 52(7):671–9. Magnusson T, Adiels AM, Nilsson HL, Helkimo M. Treatment effect on signs and symptoms of temporomandibular disorders — comparison between stabilization splint and a new type of splint (NTI). A pilot study. Swed Dent J 2004; 28(1):11–20. Sackett DL, Rosenberg WM, Gray JA, Haynes RB, Richardson WS. Evidence based medicine: what it is and what it isn’t. BMJ 1996; 312(7023):71–2. Cook DJ, Mulrow CD, Haynes RB. Systematic reviews: synthesis of best evidence for clinical decisions. Ann Intern Med 1997; 126(5):376–80. Niederman R, Badovinac R. Tradition-based dental care and evidence-based dental care. J Dent Res 1999; 78(7):1288–91. Stohler CS, Zarb GA. On the management of temporomandibular disorders: a plea for a low-tech, high-prudence therapeutic approach. J Orofac Pain 1999; 13(4):255–61. McNeill C. Occlusion: what it is and what it is not. J Calif Dent Assoc 2000; 28(10):748–58. Merijohn GK. Advances in clinical practice and continuing education “The precautionary context clinical practice model: a means to implement the evidence-based approach”. J Evid Based Dent Pract 2005; 5(3):115–24. Li J, Jiang T, Feng H, Wang K, Zhang Z,shikawa T: The electromyographic activity of masseter and anterior temporalis during orofacial symptoms induced by experimental occlusal highspot. J Oral Rehabil 2008; 35(2):79-87. Williamson EH, Rosenzweig BJ: The treatment of temporomandibular disorders through repositioning splint therapy: a follow-up study. J Craniomandib Pract1998; 16(4):222-225. Lundh H, Westesson P-L, Kopp S, Tillström B:Anterior repositioning splint in the treatment of temporomandibular joints with reciprocal clicking; comparison with a flat occlusal splint and an untreated control group. Oral Surg Oral Med Oral Pathol 1985; 60(2):131-136. Lundh H, Westesson P-L, Jisander S, ErikssonL: Disc-repositioning onlays in the treatment of temporomandibular joint disk displace-ment: comparison with a flat occlusal splint and with no treatment. Oral Surg Oral Med Oral Pathol 1988; 66(2):155-162. Simmons HC III, Gibbs SJ: Anterior repositioning appliance therapy for TMJ disorders: specific symptoms relieved and relationship to disc status on MRI. J Craniomandib Pract 2005, 23(2):89-99. Moss ML: Functional matrix hypothesis. In: Vistas in orthodontics. Kraus B, Riedel R, eds. Philadelphia: Lea & Febiger, 1962. Guyton AC: Textbook of medical physiology. 6th ed. Philadelphia: WB Saunders, 1981:137.